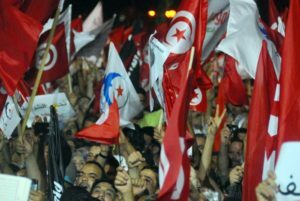 WASHINGTON — Tunisia’s current government could be on its way out, if the opposition parties get their way. Reuters reports that the Islamist Ennahda party is facing criticism and calls to step down, after two opposition leaders were assassinated within the past six months. Ennahda was immediately blamed, but denied any involvement. It led to protests, which resulted in the country’s prime minister resigning from his post. This has added to strong anti-Islamist sentiment within Tunisia, although the Islamist party has toughened up on Salafists, or strict Islamist adherents. However, this unrest could spell the end of Islamist party rule. The secular opposition told Ennahda that the Islamist government must step down before they join negotiations to resolve their current political crisis. The Ennahda party has ruled Tunisia since the dictatorial regime of ben Ali was toppled at the start of Arab Spring in 2011, which was called Tunisia’s Velvet Revolution. They are wary of what happened in Egypt, where Islamist leader Mohammed Morsi was deposed by the country’s military after butting heads with the country’s minorities and secular liberals and millions of Egyptians flooding the streets in protest of Morsi’s rule.